Peddars Cottage01263 715779work01603 870304fax Self-cateringPeddars Cottage is situated by the 13th Century Bailey Gate in the middle of the historic and ancient village of Castle Acre. The village is a treasure waiting to be discovered with its beautiful buildings around the village green, ancient Priory ruins, beautiful Church and great walks close by. There is a good pub and village shop within a short stroll of the cottage and the village is in a great location for discovering Royal West Norfolk and its fantastic coastline. Looking at the cottage from the village road, showing the ancient Bailey Gate on its left hand side. 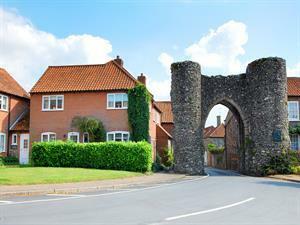 Peddars Cottage is situated by the 13th Century Bailey Gate in the middle of the historic and ancient village of Castle Acre. The village is a treasure waiting to be discovered with its beautiful buildings around the village green, ancient Priory ruins, beautiful Church and great walks close by. There is a good pub and village shop within a short stroll of the cottage and the village is in a great location for discovering Royal West Norfolk and its fantastic coastline. From Swaffham, take road to Fakenham. Approximately 2 miles out of Swaffham, turn left to village. Follow road up Bailey Gate and the cottage is on the right beside the archway.